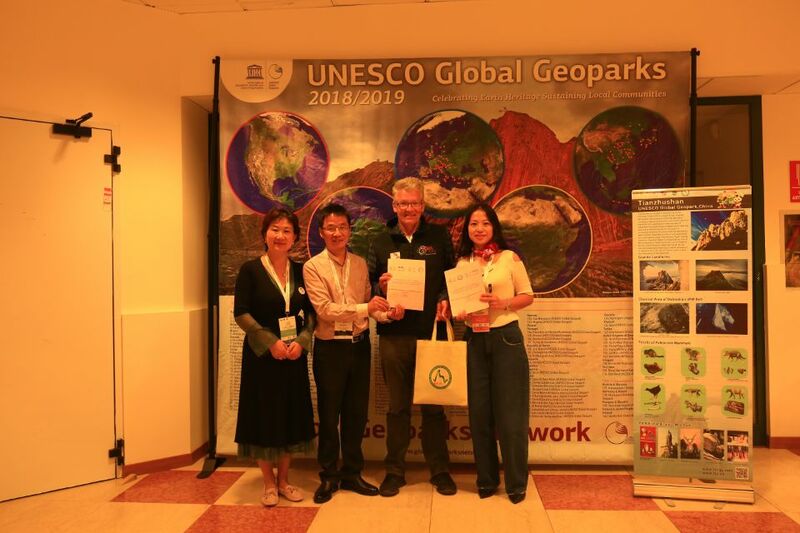 On September 10th, Tianzhushan UGGp and Terra Vita UGGp established sister geoparks during the 8th internatioanl conference on UNESCO Global Geoparks. Terra Vita UGGp is located at the transitional zone of the northern lowlands and northwestern hills in northwest Germany, covering an area of 1220km2, and the park joined the GGN in 2004. One significant landscape feature is the Ankum-Bippener Iceberg, which is located west of the end moraine. This moraine, which is 40km wide and 140 meters above the sea level, started its formation in Saale glacial age. Experts consider it to be one of the most important and well-developed end moraines in northwest Germany. Other features in the park are the Falian-Lippian uplift in the northwest, a complex isolated the Muensterlander basin in south from the lowlands in the northwest. Barkhausen Sauropus and Early-Middle Jurassic rocks in the southern part of the park; Vehrte black chalk, a special black foliar claystone, formed by coalification, and the cuesta landscape.